Have you ever wanted some one of a kind custom door panels for the interior of your custom car or truck? 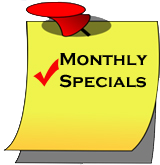 If so, I'll bet you know how much the local car audio shop wants to charge you to make them (at least $600 per door)! 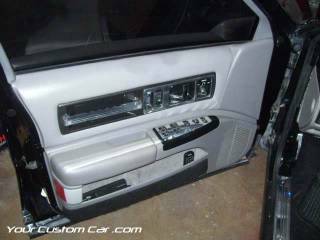 I recently made fiberglass door panels for the interior of my custom 96 Impala SS and have written this how-to article to teach you how to do the same thing. If you decide to do this yourself, you can make them exactly the way YOU want them to look in your ride! 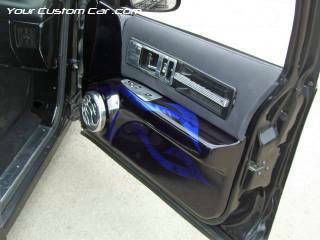 Add some TVs, a speaker component set, an amplifier that is molded into your door panel, or even some 3-d skulls if you are in to that! The sky is the limit! Just plan ahead and think about what you want the finished product to look like and have some fun! First and foremost, you need to know that creating custom door panels is not an easy task, but it is something that most people can do themselves with a little bit of time, money, and creativity. These instructions are here to show you how I personally did mine, but should apply to virtually any vehicle that you are customizing. Please also note that if mess up your door panels by attempting this, YourCustomCar.com can not be held responsible. 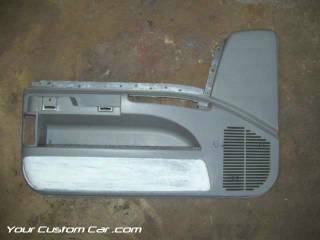 To begin, consider what you want the final results of your custom door panels to look like. Do you want to use the original design of the door panel and simply create a smooth-as-glass, paint-able, panel? Do you want to add components to the door panel, like TVs, speakers, audio components, or 3-d sculptures? Do you want to eliminate the pockets on the door panel? You will need a work area that you can use to design and construct your custom door panels. I used my garage and the entire process took me two weeks to finish. If you do your sanding indoors, like I did, be sure to prepare yourself for some serious dust cleaning when you are done with your project! In this work space you will need to have a work bench that you can get dirty. I covered my workbench with drop cloth to prevent it from getting too messed up. MDF board for creating mounts for speakers, TVs, audio components, etc. be sure to label any electrical connectors that you have to unplug and bag any screws that you remove in order to get the door panel off of the vehicle. This may sound a little excessive, but it has helped me many times in the past. Now you need to grab your bucket, sponge, and liquid dish washing detergent. Fill your bucket up with water, hot if possible, add the liquid dish washing detergent and scrub those door panels down to get all of those years of Armor All of of them! I suggest the liquid dish washing detergent because it is inexpensive and does a great job at breaking down the grease and oil on your door panels. After thoroughly scrubbing, do it again to be sure that those panels are spotless and grease free! Rinse and let dry completely.